With our Cremation Services, Renner Funeral Home believes you should be able to choose the type of service that you find most meaningful. That’s why our list of services includes many options. Photographs, a special song, even a favorite tie or golf clubs, can be incorporated into the funeral service to make it more meaningful. You tell us what it is that made your loved one so special and we’ll give you ideas for personalizing the service. The body is cremated shortly after death, without embalming. The cremated remains are placed in an urn or other container. No viewing or visitation is involved, although a memorial service may be held, with or without the cremated remains present. The remains can be kept in the home, buried or placed in a crypt or niche in a cemetery, or buried or scattered in a favorite spot. 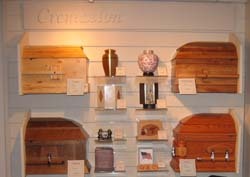 Direct cremation usually costs less than the “traditional,” full-service funeral. Costs include the funeral home’s basic services fee, as well as transportation and care of the body and a crematory fee. There also will be a charge for an urn or other container which a family may choose. Cemetery charges for a grave space or mausoleum niche and the interment of the cremated remains are also additional expenses.